Wheat Allergy? Don't Be Afraid...!! Wheat is one of the staple foods in India. Wheat/gluten allergy is particularly common in children, but most of them will outgrow the allergy till they reach adulthood. Within minutes of consuming wheat or its products, the symptoms can show up. Commonly experienced symptoms are eczema, abdominal cramps/discomfort, vomiting, diarrhoea, hives, itchy and swollen eyes, etc. Some of the rarely occurring symptoms include anaphylactic shock (chest pain, difficulty in breathing, faster heartbeat, dizziness), irritable bowel syndrome (IBS), unexplained cough. One needs to consult a Physician if one or more of the above reactions/symptoms occurs. There are many types of tests like skin tests, blood tests, elimination diet test, available for confirmation. The only way to keep the allergy at bay is to avoid wheat and its products. 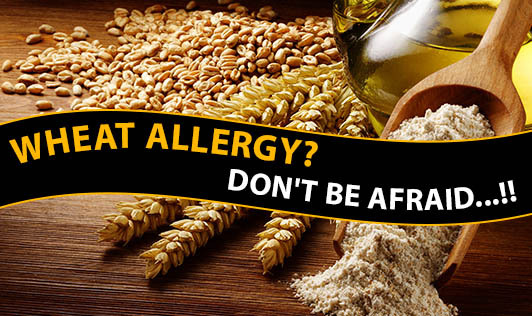 There is no need to be afraid of wheat allergy, one just needs to be careful in choosing foods!